Where Lisa Brown and Cathy McMorris Rodgers see themselves politically. 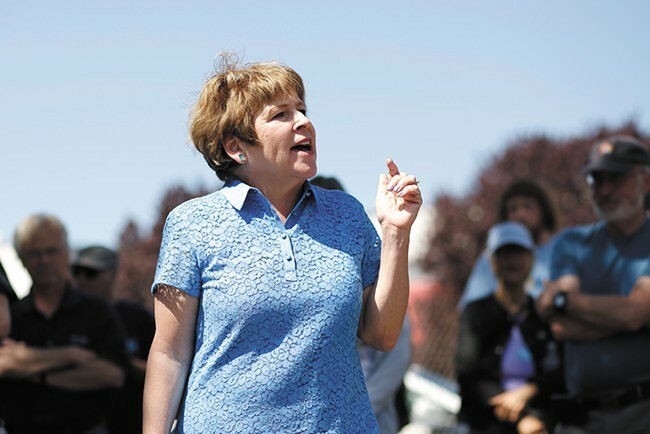 How bleeding-heart liberal is Lisa Brown? 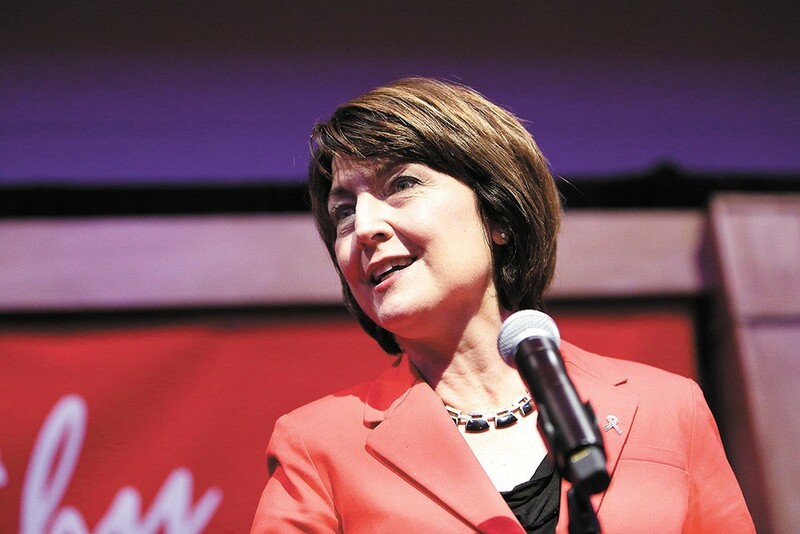 How radically right wing is Cathy McMorris Rodgers? Much of the 5th District congressional race has come down to fights over political ideology, with McMorris Rodgers tarring Brown as “Liberal Lisa” — pointing to her record of pushing for a state income tax — while outside groups have argued that McMorris Rodgers will make deep cuts to federal social service programs. 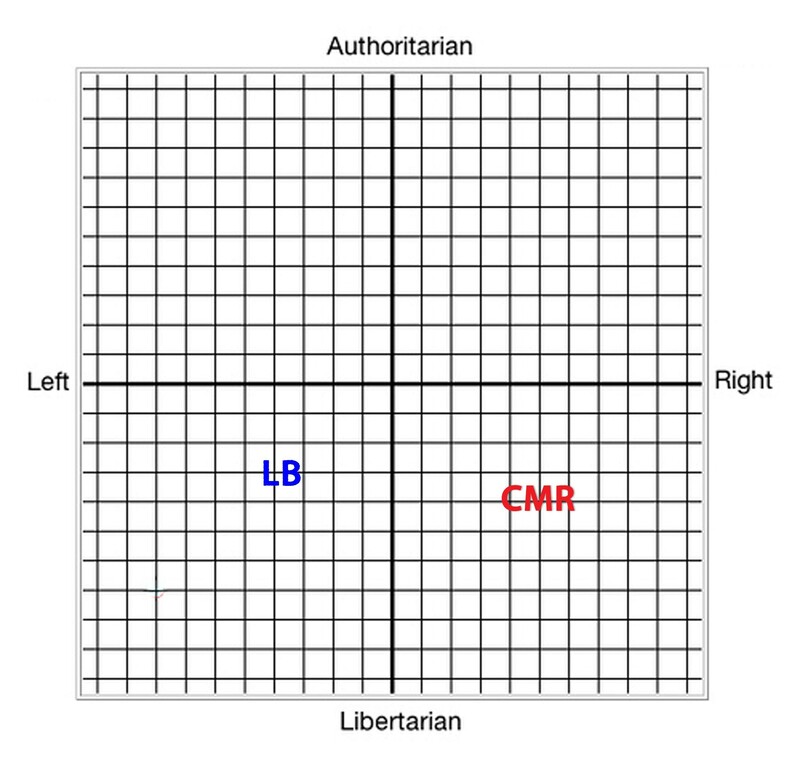 So when we sat down with the two candidates last week, we asked them to place their initials on the crude political compass grid that divides the political spectrum into left-right and libertarian-authoritarian axes. But it can be illuminating to see how each candidate, in the midst of a contentious election, views themselves. Both McMorris Rodgers and Brown say they consider themselves moderately libertarian. But where Cathy McMorris Rodgers puts herself down in the approximate middle of the right-wing section. Brown placed herself in the moderate-leaning middle of the left-wing quadrant. "It can vary from issue to issue," Brown says. "But here's the thing: I think there's a missing dimension. From my experience in the Legislature the missing dimension is not what you believe, but how you end up working with others to accomplish things. There's a whole set of things where our beliefs might be quite different, but then what are the issues that are actually in play? That's where I always spend my time." She points to her work to establish a rainy day fund as an example of where she's taken bipartisan stances that have been unpopular with some in her party. In fact, some on the left have expressed their disappointment that Brown hasn't campaigned in a more radical way. Republicans, by contrast, eagerly argue that Brown is far left, even for a Washington state Democrat. Asked whether Brown or Gov. Jay Inslee was further to the left, Baumgartner says that was hard to say, but that Brown was smarter and had more of a real record than Inslee, who Baumgartner accused of being a "backbencher, dishonest, and largely irrelevant," noting that he "can't even get his signature carbon tax through the Legislature after six years in office with a Democratic majority." But what is Brown's place in the constellation of Washington state Senate Dems? "A left-wing Big Dipper," Baumgartner responded, "Pointing the way toward an income tax, state-run health care and abortion by demand." Washington state Rep. Marcus Riccelli, who was Lisa Brown's senior policy advisor during her last two years in the state Senate, has a more nuanced take. "I think she has a progressive heart," Riccelli says when asked about Brown's ideology. "She's concerned about helping the most vulnerable. Delivering for the working class." In the past six years, Riccelli says, the Democratic caucus has moved to the left. But during Lisa's term as Senate majority leader, Riccelli says, there were a number of very moderate Democrats. They called themselves the "roadkill caucus," a reference to getting run over by both the left and the right. In that environment, Riccelli says, Brown was "right in the middle" of the Senate Democrats, in terms of the policy positions she took. "I think her heart is left of that," Riccelli says. "But what's important to that is public policy making and getting things done." In other words, Riccelli says, where she might have been be more to the left of the average Senate Democrats, in some ways, she's also a person willing to compromise, to get things done. He noted that she compromised on the four-year budget outlook, a method of calculating revenues that can constrain spending some years. "She has a progressive, idealistic heart and she governs to get things done," Riccelli says. "There are occasions, too, where she got out in front when she knew it was right and she let her values lead in that scenario." For example, on the left-libertarian spectrum, Riccelli notes, Lisa Brown led the charge for domestic partnerships and gay marriage. And, as former Washington state Sen. Chris Marr — the guy Baumgartner beat in 2010 — points out, that was pretty controversial in the mid-2000s. "It was amazing. Even on the [liberal] upper South Hill, I was running into pushback," Marr says. Marr says that, as a person who ran as a business-friendly moderate in Spokane's swing district, he sometimes found himself disagreeing with Brown on issues like worker's compensation reform. But he also says that Brown sometimes gave moderates flexibility. "Lisa understands that in order to be an effective body, she needed to understand that many of the newer members needed to have some willingness to set aside ideology and focus on practical issues," Marr says. When I ask Washington state Sen. Andy Billig where he saw Lisa Brown's record in the Legislature, he initially gave me one of those classic politician answers. But was she further left than her fellow Democrats? Was she comparatively moderate? "I think she has progressive values but she’s a pragmatist when it comes to delivering for the people of Washington," Billig says. "When she was in the Senate Democratic caucus, she was the leader. She was able to accommodate all points of views and package it together... That’s a real skill to be able to lead in a way that is true to your values and inclusive of all points of view. And she has that quality." So what about McMorris Rodgers? McMorris Rodgers is not a member of the House Freedom caucus, like Idaho's Raúl Labrador. In fact, McMorris Rodgers is a former co-chair of the "Tuesday Group," a coalition of comparatively moderate House Republicans. That may be why she has previously earned the occasional derision of the far-right accusing her of being a "Republican In Name Only" for her views on Obamacare and gun control. But her voting record, for the most part, is not a particularly moderate one. The American Conservative Union gives Cathy McMorris Rodgers an 86.86 lifetime scorecard card, making her by far the most conservative congressional representative in Washington state. McMorris Rodgers points to moments, like on family separation or trade policy, where she's publicly disagreed with Trump. But when it comes to her actual votes? FiveThirtyEight finds that she's actually more Trumpy than Labrador. McMorris Rodgers votes with Trump 97.8 percent of the time, while Labrador scores a mere 82.7 percent. Partly, that's because Labrador is more radically conservative than Trump, voting against spending bills, opioid legislation and the Republican's more moderate immigration bill. In fact, immigration may be one of the key ways to understand the place McMorris Rodgers holds within the Republican party. She voted against the Freedom Caucus' more draconian immigration bill. But she also opposed more moderate Republican attempts to bring a clean bill to protect DACA recipients. On one hand, she's asked that more refugees be admitted into the United States. On the other hand, she signed the petition to undo the city's longstanding prohibition about asking citizens about their immigration status. Moderate? It depends on where you place the center. McMorris Rodgers wins the battle, but her House Republicans lose the war. Was it worth it?